The player will type an answer and click “OK”. If the answer is not correct, a message “Try again!” will show and the player clicks “Close” to try again. if the answer is correct, a message showing “Correct!” will show and the game ends. We are trying to get whatever the player typed in the pop-up box and store in a variable answer. So we can use the variable to check whether the player has entered the answer you are looking for, in this case, 16. We use 2 equal signs (==) to do a comparison, of the value on the right side is equal to the value on the left side. We use 1 equal sign (=) to assign the value on the right side to the variable on the left side. If the player did not get the correct answer so that we can refresh the page and let the player try again. If the player gets the correct answer, we do not need to refresh the page. If(…) and else are very commonly used functions in any programming language. It’s like in real life situations, we always have options such that if we do this, we will get this, else, if we do that, we will get that. So during programming, we need to tell the computer exactly what to do in different situations. In this case, if the player gets the wrong answer, prompt a message and refresh the page. Else, if the player gets the correct answer, show a message. Type or copy the above code in Visual Studio Code and save the file as quiz.html. Open the file and enjoy your game! Teaching kids how to do coding has recently become quite popular here in Singapore. I checked out some of those classes that aim to teach children how to code. Most classes are either robotics or uses the Scratch platform. I checked out the Scratch website and attempted to learn programming via their method but did not understand nor how to code without using the website. If you have done flash animation before, it feels more like that than doing coding. Drag and drop pre-configured motion action, logic for the various conditions that you want to animate the otherwise motionless still-image sprite. For the text editor, any computer should come with a default text editor, for example NotePad on Windows or TextEditor on Mac. Although the basic editor works as well, but using applications built for coding would make the task much easier. You would have less chance for bugs in the program due typo error because a suitable text editor will provide suggestions to help you autocomplete your code. Logic error – no typo error code works but not the way you wanted it. For example, you wanted your animation to move left upon click but it moved right. Keyword – there are many different programming languages. Each language have their own keyword for you to use to build your code. They usually have lots of documentation, official and non official, to explain the keywords and even the ready made functions (similar to excel functions) that you can use to build your code logic. Back to the text editor recommendation. Notepad should be familiar to anyone who uses Windows. It’s good enough to use for taking down and storing some notes but definitely not good enough for coding. The Notepad++ is a free software, downloadable for Windows. Just navigate to their site and hit the big Download button to install. Using Notepad++ looks better than using Notepad but you would still need to type everything out yourself. For those familiar with Microsoft Visual Studio, no, this is not the same as that. Visual Studio Code is also developed by Microsoft but is a freeware that can be downloaded at no cost. In the book, the author recommended Sublime but on the website it indicated that a licence is required for continued use (which means you need to buy) so I would prefer Visual Studio Code instead. Both applications can be downloaded for both Windows or Mac. Firstly, you just need to type a few words and the Visual Studio Code would list out some suggestions for you so that you only need to select the option that you want. And the fonts are colour coded, so you know which are the keywords. Now we can start our very first program! The first basic program, basically just pops up a “Hello World” message when you open the file in a browser. Open your text editor and type in the words, unless you use Visual Studio Code, you might not need to type in everything. Save the file somewhere. Click the File button at the top of the editor and select Save. Enter the filename as Hello.html. Go to the folder where you save your file. In windows, the default should be in My Documents (full path should look something like this “c:\users\<your username>\Documents”. In Mac, the default document folder should be in Documents. Open the Finder. Select Documents folder. You should see the file Hello.html. Double click on the file. It should open up in your default browser and look something like this. Four years after we first brought the kids to visit Hong Kong, we are back here with now 3 kids in tow. What a difference 4 years made. Besides a bigger family now, the girls have also grown, no longer the can-bring-them-anywhere toddlers. But for some reason, Hong Kong now seems slightly more kid friendly than before. And we definitely welcome that. Many hotels are offering kids-centered program and kids/family friendly rooms, although not at pocket-friendly prices (unless during off peak seasons). There is even a whole mall dedicated to kids! 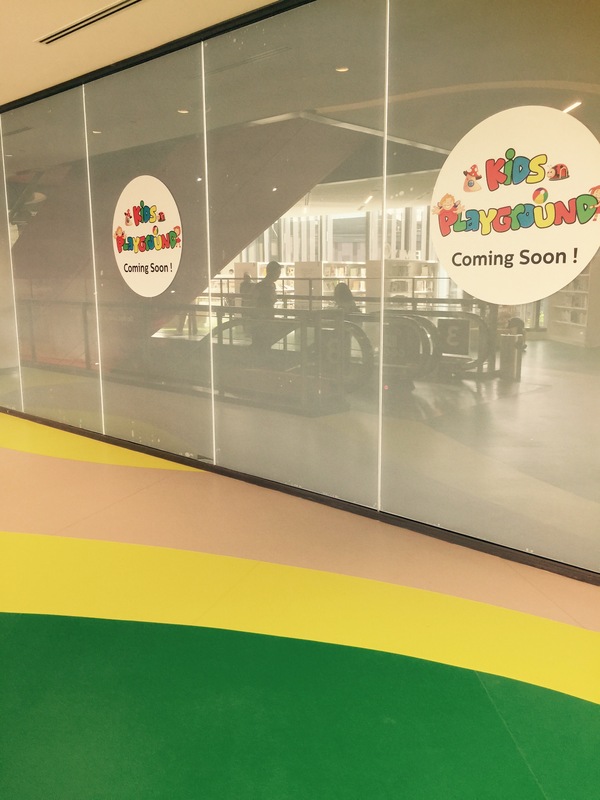 It’s branded as the world’s first multiple intelligence kids mall! How impressive! Transportation seems easier than before as blogged in this entry. The main reason to be accredited to technology advancement. The regular taxi scene remains unchanged as from 30 years ago, according to a local there. There are still the same nostalgic Toyota Crown 4 or 5 seaters taxi, with the addition of a new taxi type, which is the maxi cab which is mainly for wheelchair bound passengers. But they are still 4-seater taxis. Now with Uber and online travel agencies like Klook, booking a transport in Hong Kong was a breeze. For this trip, we used mainly Klook to book our transport as we can be guaranteed an MPV which can accommodate all of us, plus our luggages. It’s so easy to book through the app and cancellation just requires a 24hour advance notice. Plus the year end promotions offered, the pricing was quite attractive. I wonder if anyone would still arrange airport transfers with the hotels which charges at ridiculous rates. Our main interest being, to enjoy the cool weather and also to let the kids have some holiday fun. This trip, we explored the area of Whampoa, Kowloon for the first time. Several bloggers wrote about it and we too, decided that we could give it a try. So here’s my account of our experience in this part of rarely-a-tourist-area place. We booked 2 connecting rooms here and the kids were happily zooming around from one room to the other. The hotel had a very grand and spacious sea-view lobby, which gives an instant feeling of relaxation in the middle of a festive(read crowded) period. The room was average with adequate amenities and toilet was equipped with bathtub! But wait till you see the exterior! A breathtaking view awaits us at the rooftop with an aquarium-styled heated outdoor pool with a city view as the backdrop. The weather was too cool and windy for a swim so we did not try. Best to be all wrapped up in our cosy jackets! We took a nice evening stroll behind the lobby after checking in, just to catch the lovely sunset, watch the city light up and see traditional junk boats sail past. When we first chance upon this place we were quite doubtful of it being ‘Wonderful’. There were not a lot of reviews on TripAdvisor and the reviews were not that great. And from the street view on Google map, the place looks a little far our imagination of wonderful. One blog that we read also had the same initial doubtful feeling but ended up surprisingly convinced. And I’m glad to say that we made a good choice for a family stay. It’s quite true as per the reviews that there is nothing much to rave about the shopping there and the prices are on the slightly high side. According to 1 local, the area is more for the middle-income residents which explains why, but if you are looking for high-end shopping, you might be disappointed that there are none here. So what do we find wonderful about Whampoa? Aeon mall in the middle of everything! Formerly known as Jusco, Aeon is a retail group originating from Japan. If you have been to any aeon stores, you might know that they have very interesting range of things, even supermarket items! Bright, spacious mall, well stocked supermarket with a wide variety of goods, retail items like clothing, baby essentials and shoes for example. There are also sections for beauty items, stationery and household items. Really convenient for us especially when I had to cook for the baby. The supermarket stocks fresh produce like corn, potatoes and eggs which were mostly imported but were really fresh and very yummy, as approved by the little ones. The Whampoa area consists of a few main buildings named as the different Worlds. For example, Treasure World, Fashion World, Gourmet Place were our main interests for kids (Treasure), shopping (Fashion) and food (Gourmet). All the Worlds were within walking distance from our hotel. Along the way from our hotel to the main Worlds, are the residential blocks, with many other shops and eateries filling up the ground level, for example, Maxim bakery, Watson and Cafe De Coral are some of the shops that we pass by everyday. Sometimes we drop by the playground and let kids do some workouts. The MTR is also within walking distance and is the first stop of that line so it’s easier to get a seat. We were excited to know there’s a huge indoor playground nearby for the kids here. The kids had lots of fun and did not complain about the walking. The pricing of the rides were not cheap though, but at least the kids were kept entertained. 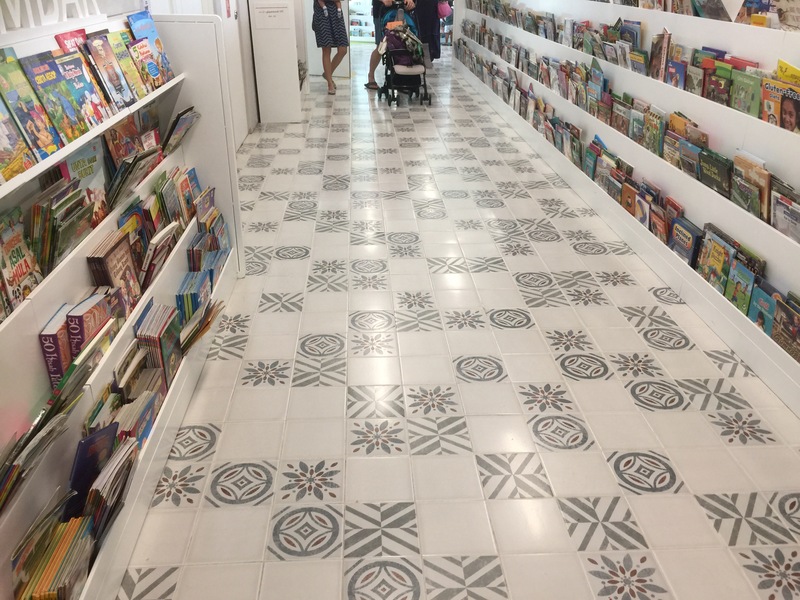 There were shops like Toys ‘R us, Popular Bookstore and Dr Kong here as well, in case you are buying stuff for the kids. Oh, and McDonalds is here as well, anytime for a french fries and nuggets meal. There is also a very large branch of Marks and Spencer’s here. Happy shopping for the Mummy and playing for the kids and the Daddy. A trip to Hong Kong doesn’t feel complete without a trip to the Peak. We arrived early hoping to skip some crowd. And had the famous Mak’s noodles for breakfast. There was no queue here to our pleasant surprise. Too bad the kids didn’t really fancy the food and preferred my home cooked food prepared for the baby instead. At least they had some breakfast. The Peak Tram queue was incredibly crowded so we skipped that totally. Staircase everywhere so it’s common to see people carrying stroller up and down.. Since we were in the vicinity and had some time, we came by this park after reading many good reviews. The kids playground here was really a game changer. It’s like 6-in-1 playground. We usually only get one if them at any one place but over here we have 6 of them all together. Ok I guess we will be stucked here for some time. Surprisingly, we didn’t. The kids got stricken by static a few times while sliding down the slides they were tearing, so we ended the trip early. Not sure it’s the jacket or the dryness that’s causing the static, what a pity. Four years ago when we came here, the girls were too young to enjoy the rides. They were also crying away when taking photos with character, intimidated by the size of the character costumes. This trip, they sure outgrown all of it and had lots more fun that now they are asking to go back again. I was secretly expecting the baby to be crying away upon seeing the characters. Surprise, surprise, he was so excited like as if he met an old friend, attempting to lead every character off to somewhere to play, making everyone bursting out in laughter. Here’s a tip. For a Disney trip with little girls, always prepare a/few set of princess costume. In the happiest place on earth, girls would love to dress up even if they usually don’t . We did not stay at the explorer Lodge for this trip but we dropped by to take a look. Really new and nice. Shall try the next time. Finally, it’s going home time. We were so fascinated by our brand new Changi Airport Terminal 4. It’s spanking new and it’s high-tech. Even the restaurants look so interesting. As we had a baby in tow, we could not try the self check in terminal, so we went straight to the counter. We saw this irresistible promotion on Cathay Pacific for Premium Economic that we decided to give it a try. We had a pleasant surprise when we got a free upgrade to Business Class on the departure flight due to a change in aircraft. First experience on business class! Super worth. We did try the premium economy flight not he return flight and the seats were indeed more spacious than the economy. The kids can’t wait to go back to Hong Kong Disneyland. Hope we get to go back soon! But for now, its back to school, back to work time! 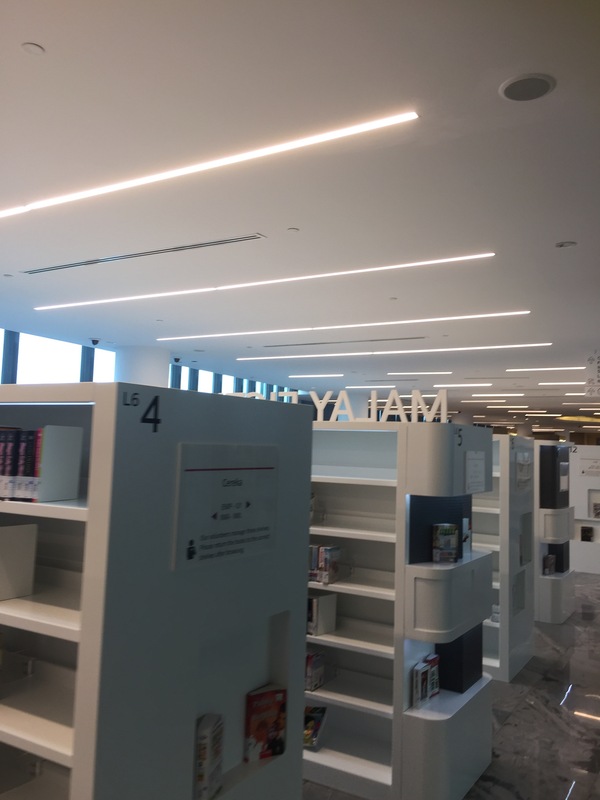 Got a chance to swing by this latest, much talked-about and exciting library today and I can say that the standard of our libraries here have gone up a notch yet again. 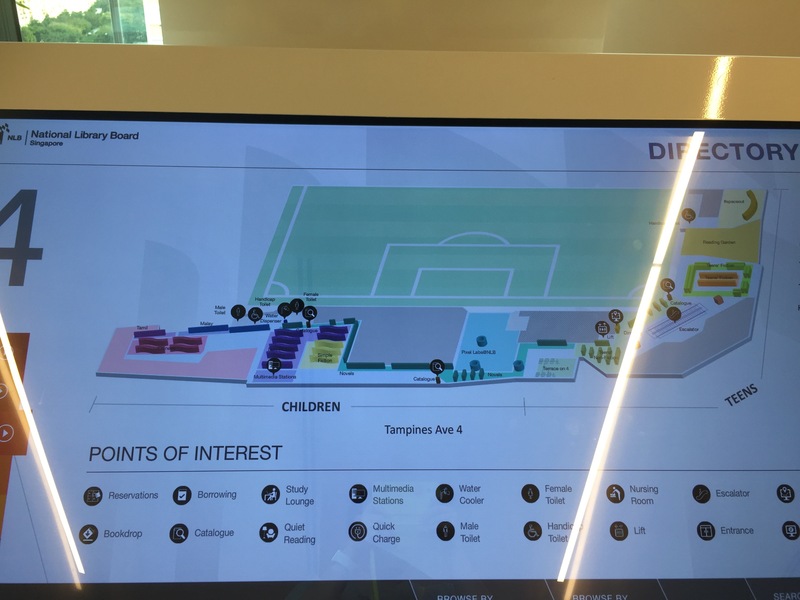 Looking at the amenities they even have charging points and nursing room? Thumbs up! Pardon the reflection on the picture. 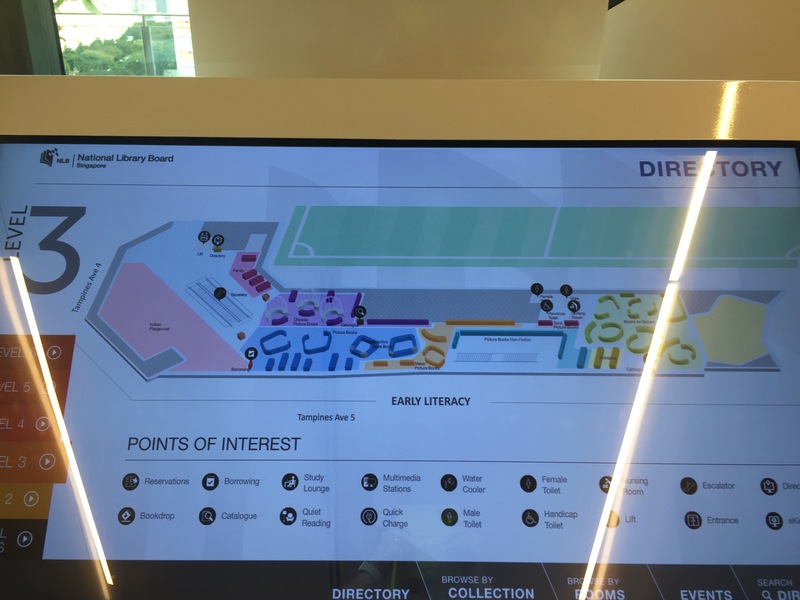 I couldn’t find this layout on the NLB website so I took a picture from one of their digital directory guide in the library. 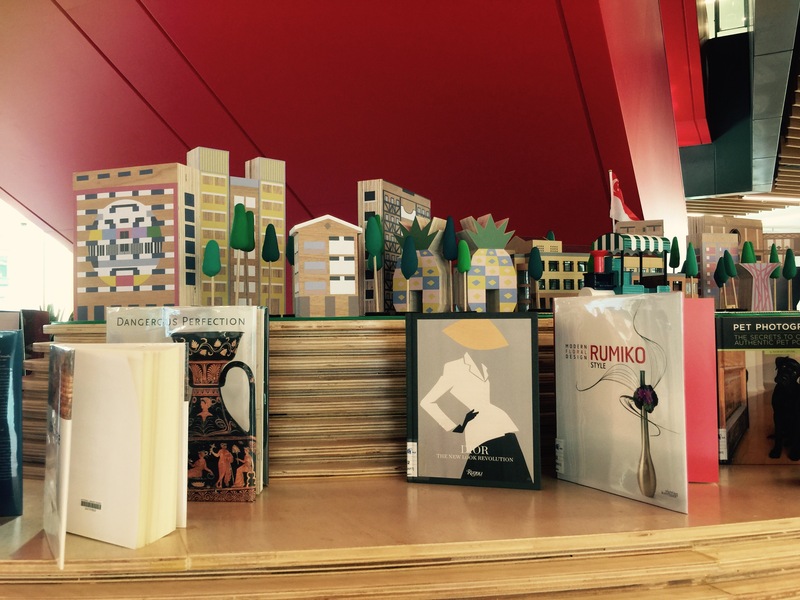 Starting from level 2, we can find all the books related to our every day lives. Be it sports, magazines, cooking, hobbies etc. I was busy admiring the displays and amenities on this floor than notice the range of books though. 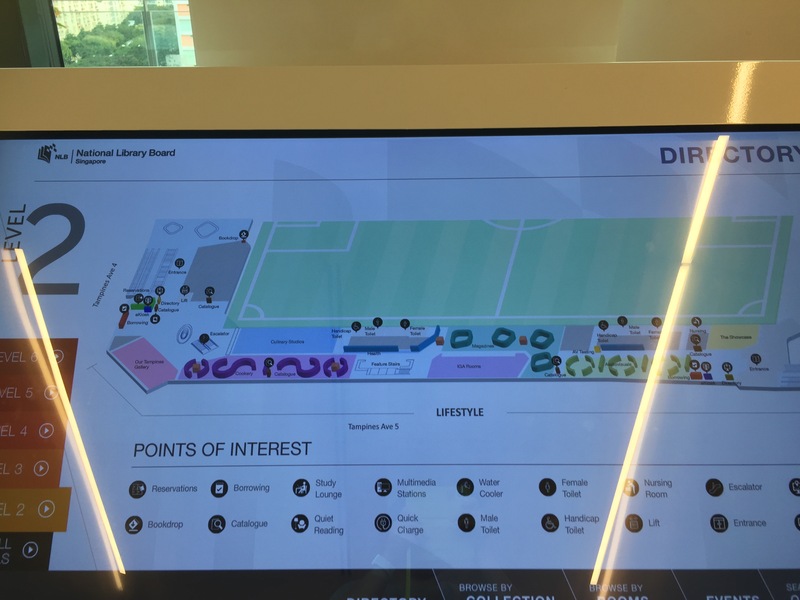 Firstly, the library faces the view of a large, inspiring soccer field. 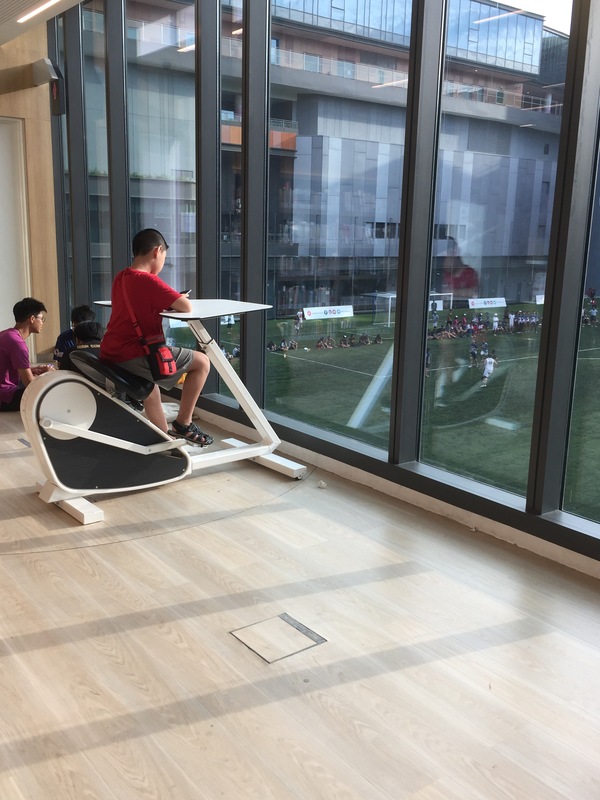 Then there is this one and only bicycle reading table that you can cycle and read a sports book at the same time and be inspired by the sportsmen out on the field ‘live’. It looks like there may be more of this bicycle though since there is some empty spaces here. 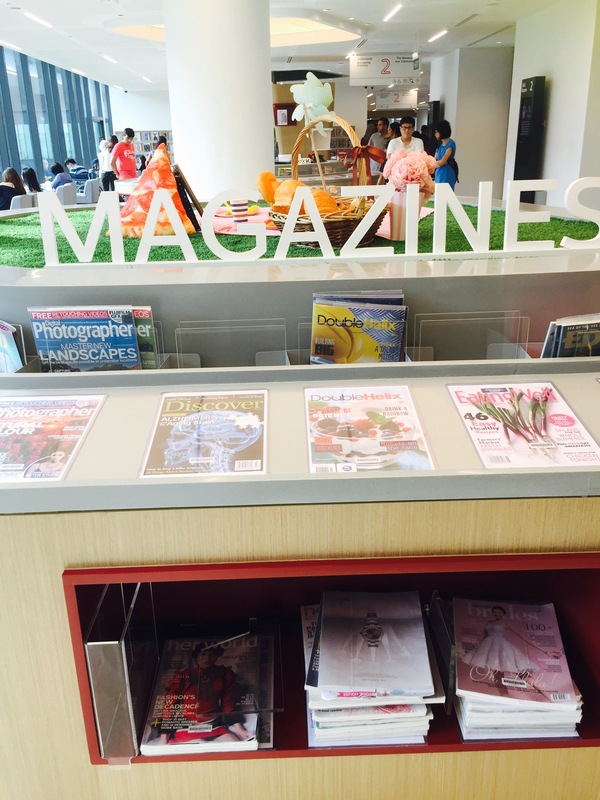 Then you see nice, uncovered displays over the usual magazine racks that makes the magazines look more interesting. 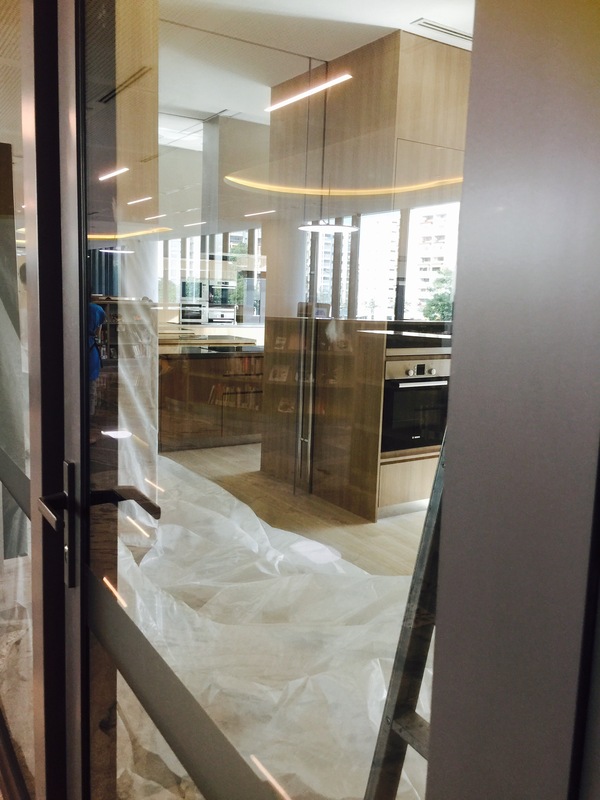 Then you see this under renovation kitchen studio where cooking classes would be conducted and you’ll be inspired to grab some cooking books home just outside the studio. Room for watching soccer together? And there is this big empty room with a huge screen showcasing our National day parade. Wow. 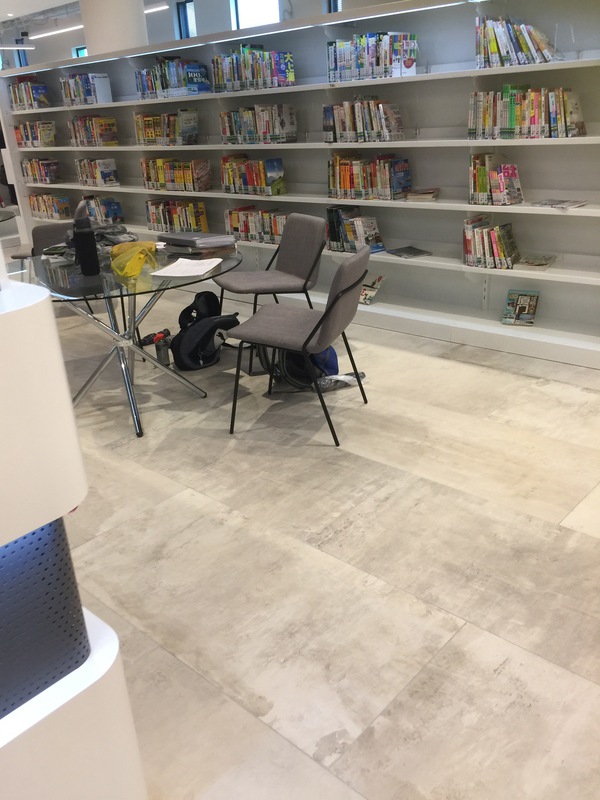 Kids playground in a library?! Seriously? 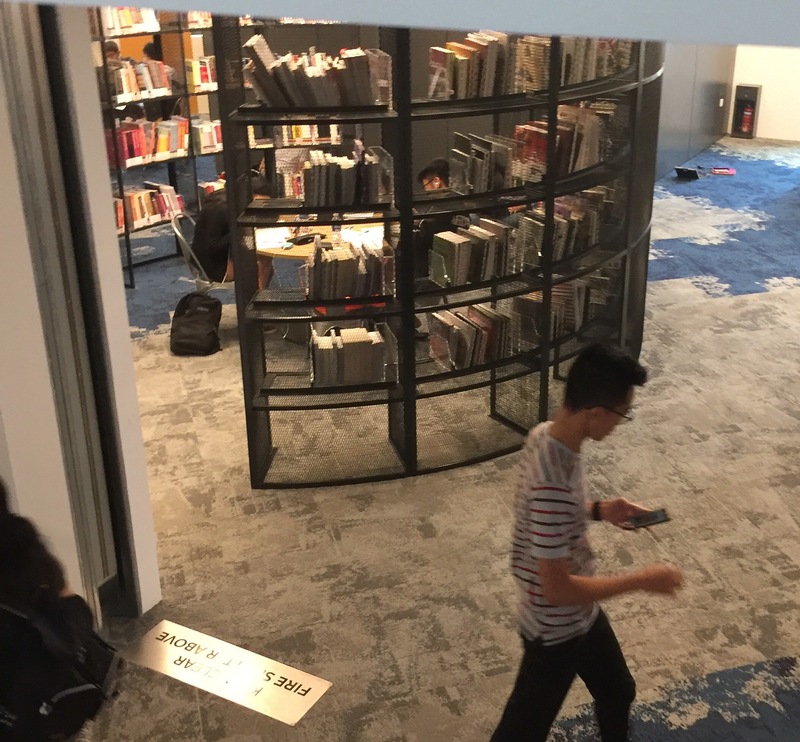 Do we really need a playground in a library? It seems unrelated to encouraging reading of any kind. 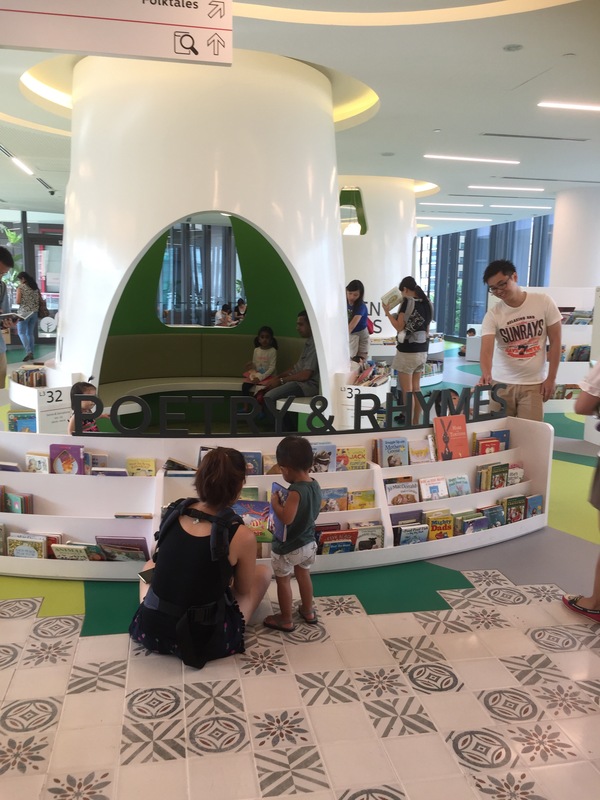 The only good reason I could think of is for parents to have some time for books while the kids have fun just next door. But maybe the library has some other playground idea instead. It’s still empty for now so let wait and see. Could be really exciting if it’s a new concept playground! And hope the glass is sound proof! I love the layout of books and shelves at this level. 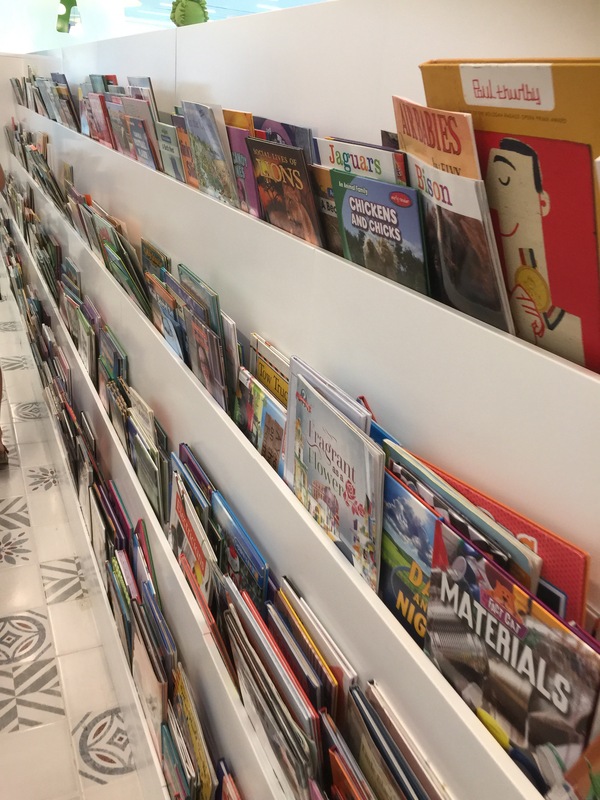 Every book is displayed with cover facing out instead of stacked together with only the book spine facing out. Parents and kids and easily choose a book of interest (although mainly judging a book by its cover). But then again kids this age can’t really read yet so the picture on the cover says a thousand words. Brilliant! When I pick a picture book for my kids I also tend to look at the pictures and decide whether this book is suitable or not then pick it up and briefly read the contents to double confirm. Level 4 is still for kids, but for Emerging Readers, juniors and teens. 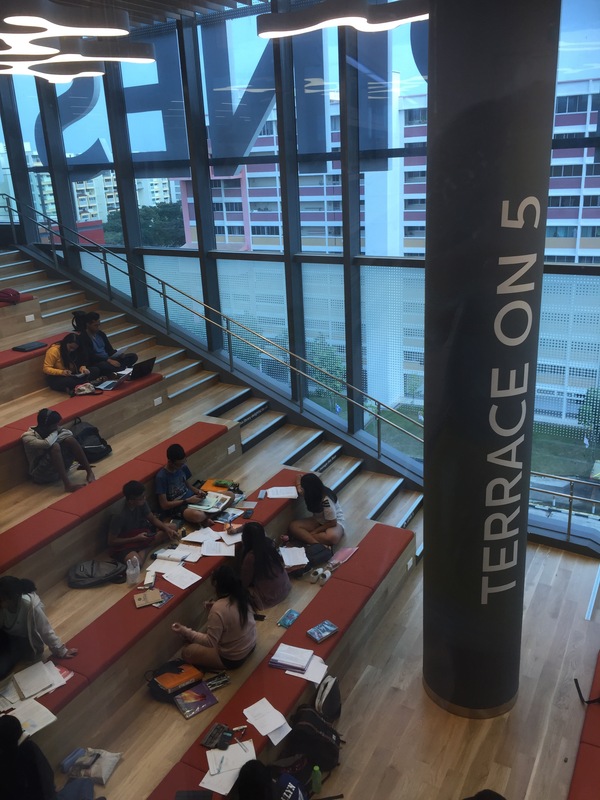 For the teens section, the emphasis is more on spaces for group revision and discussion. 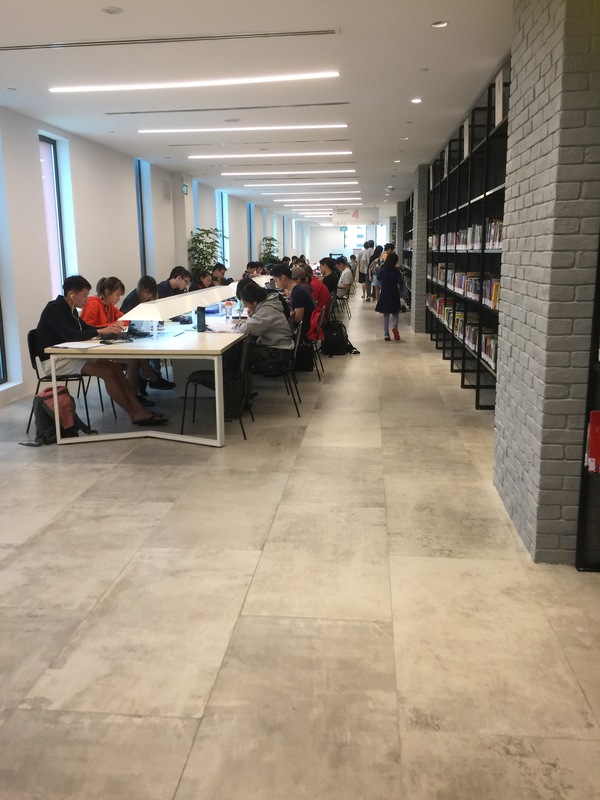 The rows of tables can be seen to be filled with teens and their laptops and notes, studying for the exams. 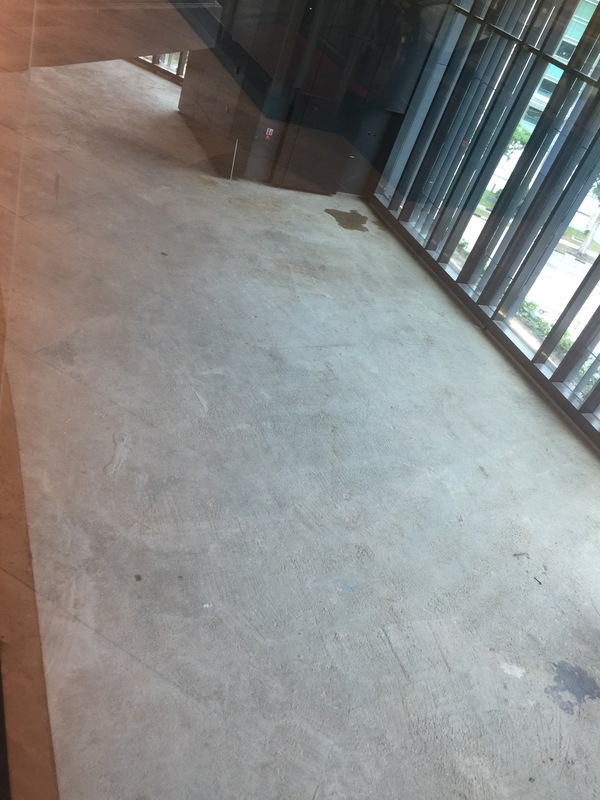 This place is definitely more conducive than camping on the floor at Changi Airport, if you can find a seat. Only thing is you can’t eat here and blast your music on your Bluetooth speaker. 2 levels of compactly packed bookshelves seem too much for now as can be seen, they shelves are mostly half filled for now. Should be expecting lots of new books to fill in next time. The shelves here can be seen to be more closely packed on these 2 levels and some walkways only allow single file walking. There are still abundant proper tables and chairs and sofas for us though they are still all fully packed. 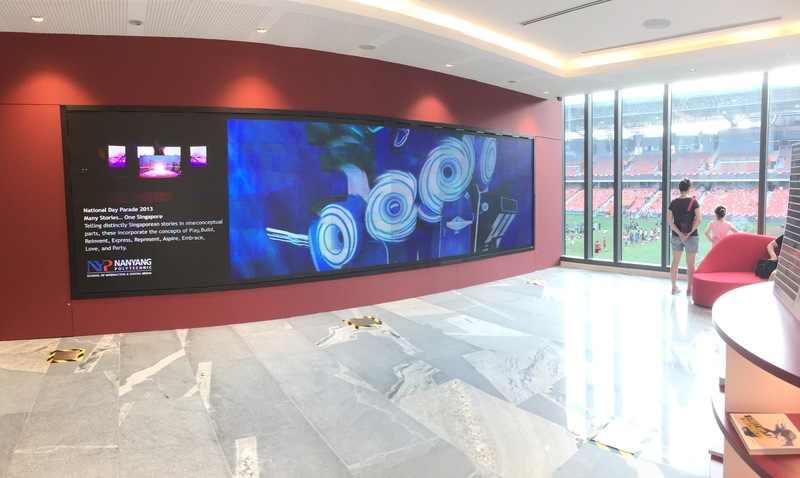 The media section looks quite cool with monitor screens this huge. 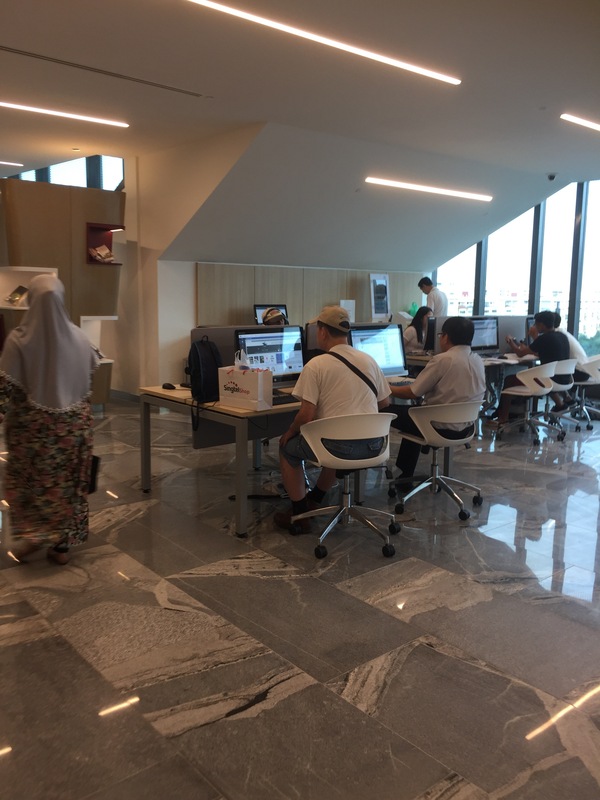 This library really has quite of fair bit of electronics. 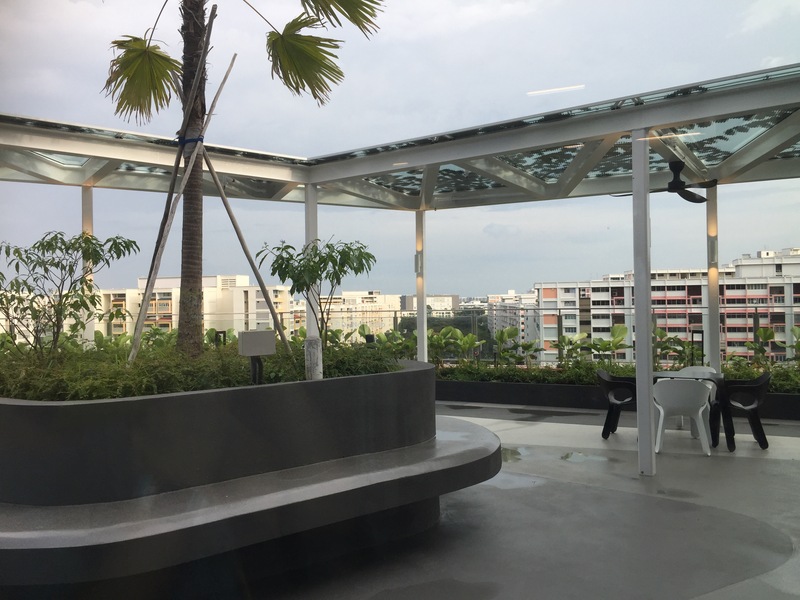 Outdoor garden to take a breather? 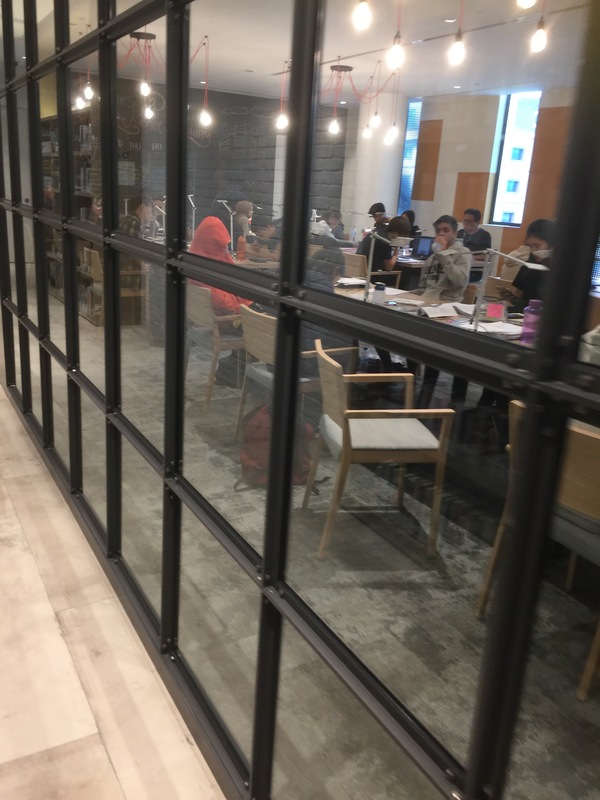 Then we have this cool looking outdoor space which is closed for now but seems like a good idea for groups since the noise level is not so restricted. We were excited when we learnt that this year, our favourite airline, Singapore Airlines, has quite a number of air ticket deals to New Zealand, such as this one. It was a very good promotion and definitely a deal hard to resist. Problem was we knew we had to make a lot of planning if we were to self-drive there, and we did not have a lot of time left to make the decision. Traveling with 3 young kids (one being an infant) can be challenging especially in the winter! Then we came across the idea of private hire tour services that is slowly gaining popularity in New Zealand. It was definitely our preferred way of travelling as we could have a lot of flexibility in our itinerary, and more importantly enjoy the holiday and not worry about vehicle and travel logistics. We had not quite heard about it previously as everyone we knew, self-drove there. So we did lot of research and finally settled on Call Jeeves Tour. What really appealed about them was their fast responsive email responses, and understanding about traveling with kids (which is always challenging). Being a family owned business, they are personalised in their interaction and flexible enough in terms of changing itineraries and not as rigid as some other operators who are more commercially operated. Call Jeeves also had a good rating on TripAdvisor which was really icing on the cake. We have since completed the trip and we were very impressed by our driver/owner, Warwick, and his wife, Karen, for making our trip so memorable and relaxing that I thought of sharing our experience here. Days after returning from New Zealand, our kids are still missing the duo (they never felt this before with other private tours in other countries) and asked when we would be returning to New Zealand! Upon arriving, we were picked up by Warwick at the airport arrival hall. For those who are unaware, New Zealand has strict immigration rules which apply to food and medicine. Parents need to be aware of this, and ensure that all rules are complied. I will share more about this in another post. Our ride was a spacious Toyota HiAce Commuter mini-coach, with enough seats for 9 passengers and plenty of space for our stroller and bulky luggages. The vehicle came with an infant seat and 2 children car seats which by the way were mandatory accordingly to NZ law. With all these, we were set to go! Most of the itinerary was planned by Warwick based on understanding our requirements and ensuring that we optimise our time in the South Island. Multiple emails prior to the trip ensured that we tweaked the itinerary to exactly what the family is expecting. With different age groups within the party, it is really difficult to plan! Outcome? The whole trip was relaxing, and not too hectic, and yet with all key attractions visited. Perhaps the only regret is that we should have spent more time there! Parents will really understand this. With lots of long hour drives around New Zealand, we would often stop for our toilet breaks as well as stretch ourselves, get some coffee and snacks. We were grateful that Warwick had planned some of these breaks such that we could hit a playground and let the kids have some fun and fresh air. Many toilets had playgrounds next to them, and these were really welcomed by the kids! And they really had lots of fun running around in the cool weather, with a thick jacket and still not sweat. Look at the priceless expressions of the kids! After 3 days of bread and fish & chips, the family started to crave for comfort food (a.k.a. Asian food). Thus we went around searching for these restaurants. Although there was no “wantan mee” (dumpling noodle) or chicken rice, Warwick managed to find us restaurants that served decent rice with dishes and noodle soup. This was really welcomed by the kids. End of the day stops will always include a pit stop to the supermarket to stock up items for the next day (including instant noodles and potato chips!). Warwick knew exactly where the supermarkets with a good range of stuff (i.e. Countdown, Pak and Save, 4 Square) were located! This saved us a lot of valuable time. The hotel we were in had a minor fire incident which resulted in full evacuation. Cause of the fire is still unknown (according to hotel staff when we left). During the incident, my hubby called Warwick and he and Karen appeared within 10 minutes trying to see how they can help. This was really good service. While both of them cannot fight fire, their presence kind of calmed the family, especially the seniors. They went around with my hubby asking for updates while the family waited. This was really appreciated. And sorry for making them miss their dinner, which we understand they were mid way through. While fires do not commonly happen on holidays (which we hope not! ), having a local like Warwick and Karen does help when such need arises. We were eventually allowed back to the hotel in the night, which was a real relief to the family. Evacuated from hotel after some fire occurred near the hotel premises. For those wondering what’s the damage to your wallets, it is typically more expensive as compared to similar services we tried before in countries like Korea and Taiwan. This is partly because of the higher standards of living in NZ. Goods and services tax is also very high there at 15%! There are strict rules governing such services in NZ (i.e. mandatory rest hours etc. ), and this really makes it a very safe mode of transportation as compared to self-drive. One possible way to cut cost is not to use the driver services in areas where you can walk around, (for example, Queenstown) provided that the hotel that you stay at, is near the shopping and restaurant area. However, you will have to note that many places in NZ do not have public transport services easily available especially in the rural areas. There are coach services around but they are definitely not as convenient for our group. You can always discuss the different options with Call Jeeves to ensure that you have a budget fitting vacation! After traveling with Warwick, we definitely see the benefits, and it’s totally worth it! Time flies, and its really hard to say good bye after 10 days of touring the South Island together. Unlike other private tour operators we had encountered in different countries, Warwick and Karen came with us for the flight check in and accompanied us to the boarding gate. This was really a nice gesture, and everybody hugged good bye at the gate. There was a tinge of sadness, but we know we will be coming back one day. Hopefully to both North and South Island! And Call Jeeves will definitely be one trusted operator and friend that we will call upon if we come back again! Till we meet again guys ! Thanks for a memorable New Zealand South Island trip! Note: This is not a sponsored post. Stay tuned for subsequent posts detailing on the trip!